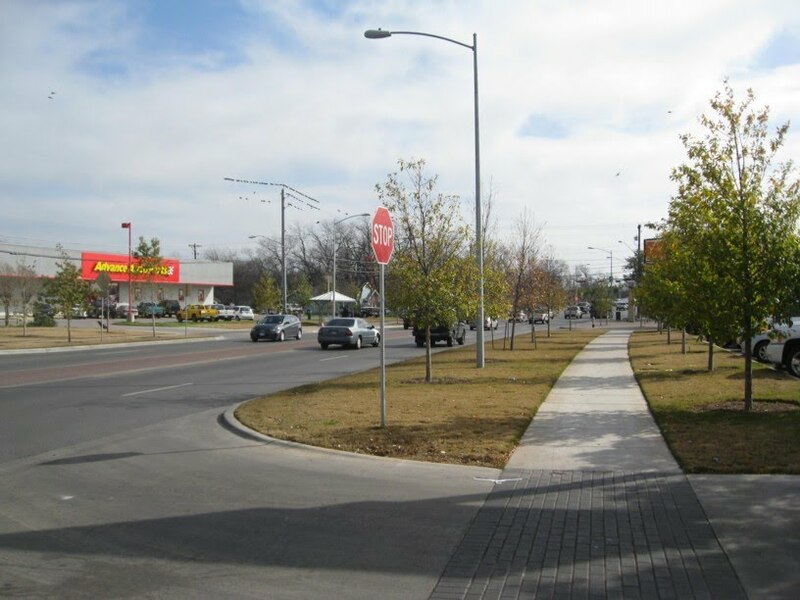 Here is an image of 7th Street looking east to the intersection of Pleasant Valley, before changes were made to the street. The shopping center to right is Govalle shopping center, with an HEB. 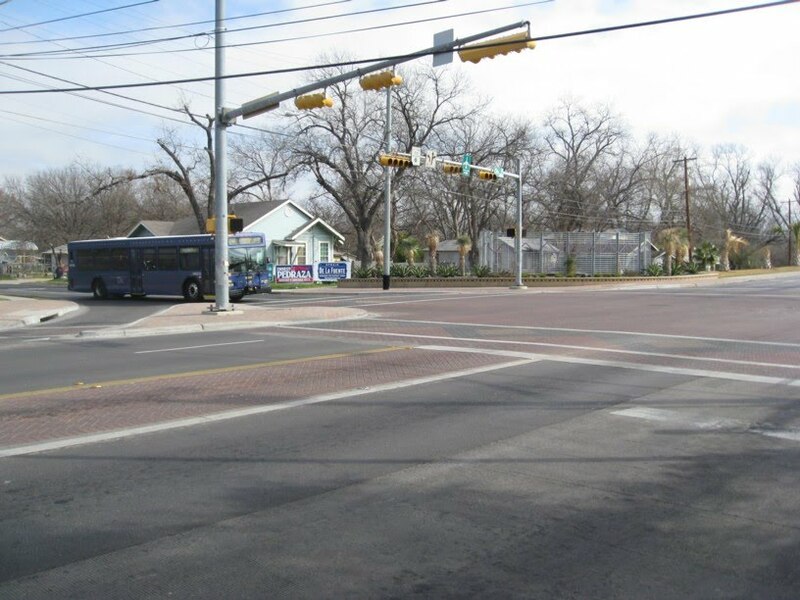 A bus can be seen at the intersection. Click on photo to expand. 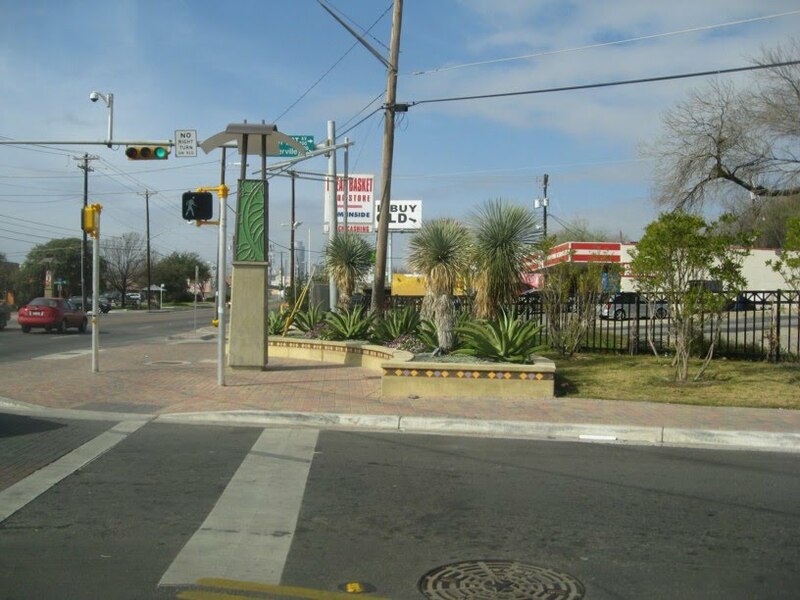 This is the intersection of 7th and Pleasant Valley, looking northeast, before changes. 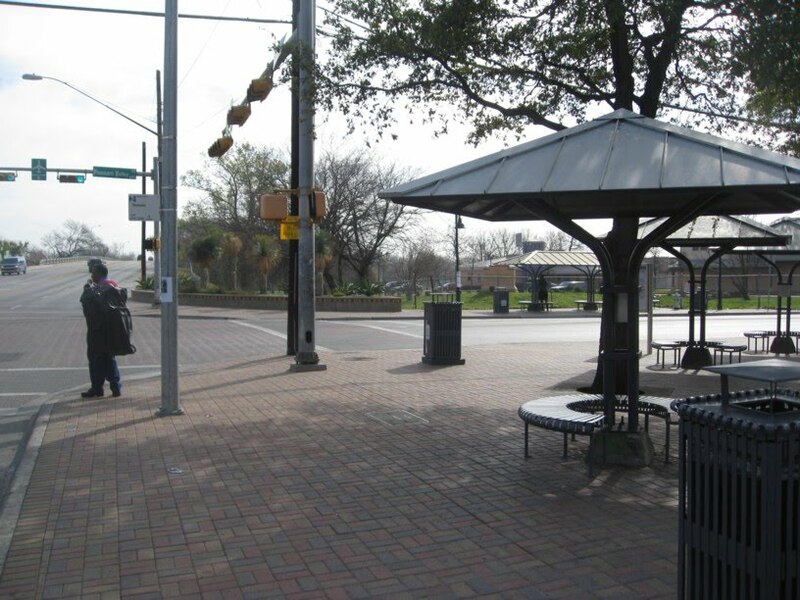 This is the intersection of 7th and Pleasant Valley, looking towards the northeast corner, after changes. 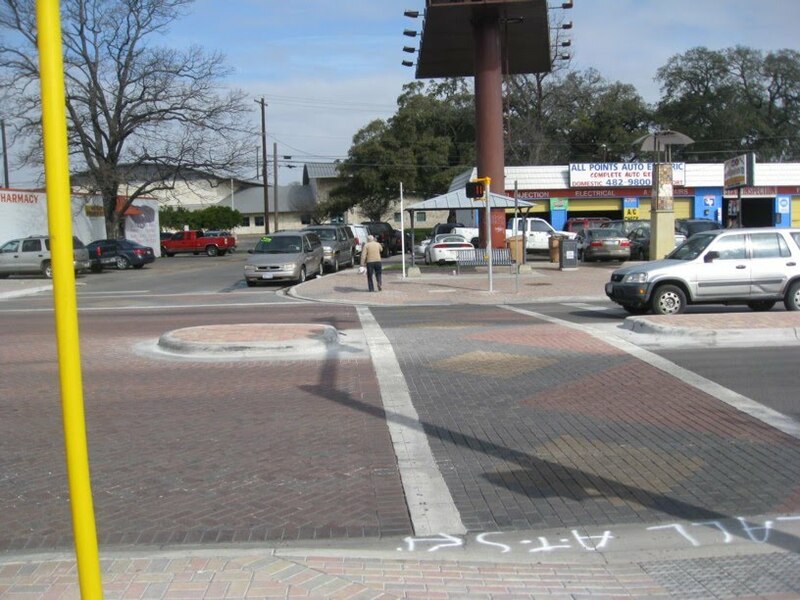 The intersection uses street stones to signal a pedestrian-oriented zone. The stones also cause cars to slow down. The same is true of the median. It's hard to see, but the notheast corner has a landscaped screen fence to buffer the residential neighborhood from the street. This is the southwest corner of the same intersection. The corner already had bus shelters and trees. Reconstruction deepened the corner and added the brick hardscape, since higher pedestrian activity here would kill grass. 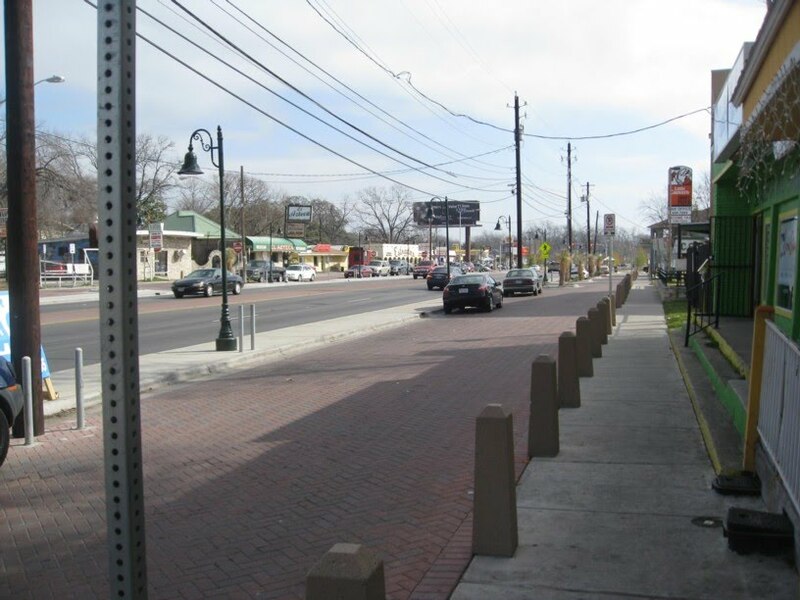 The depth of this pedestrian zone is about 25-30 feet, which is considerably deeper than the 15 ft being proposed for Burnet. 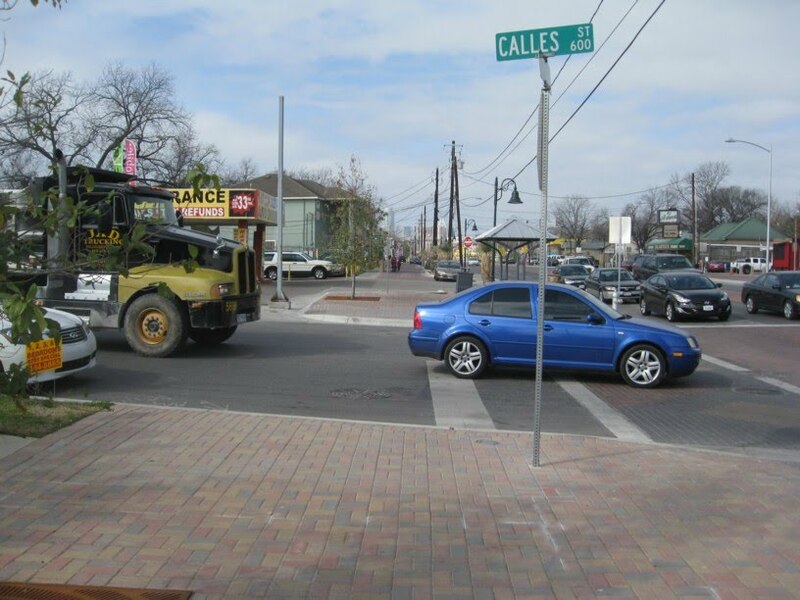 We need to provide feedback that places along Burnet need more depth to assure this quality environment from a busy street. This is the southwest corner, looking west. The Govalle Shopping Center parking lot is to the left. 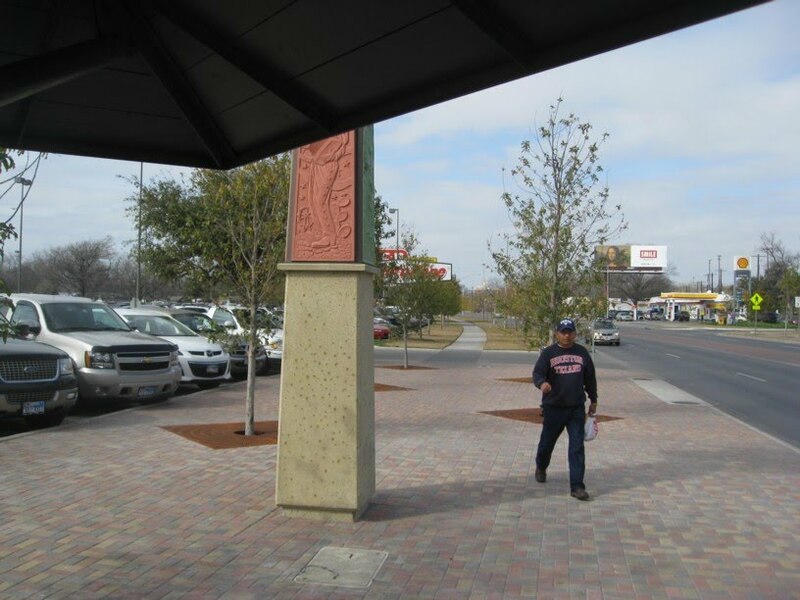 The obelisk features art from local artists. The side of the obelisk has a map to the area. 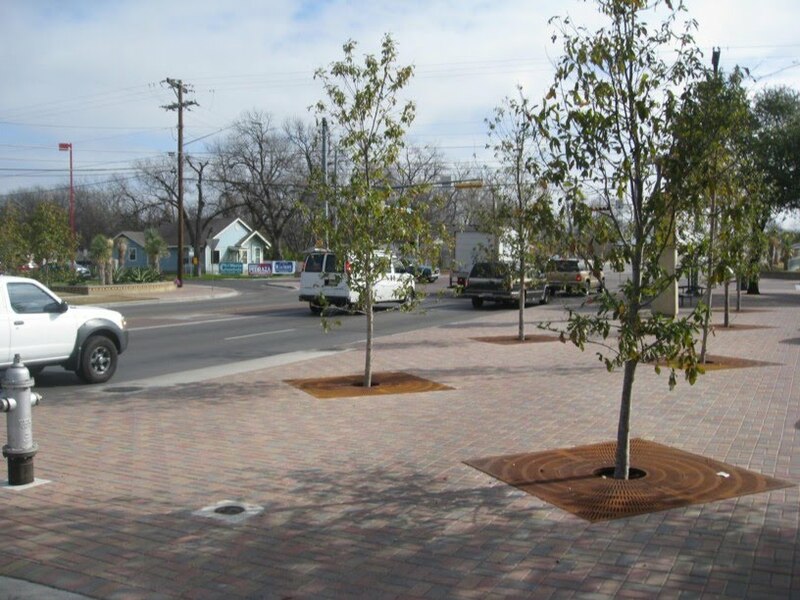 Here again, an attractive streetscape with extra depth from the roadway and trees on both sides requires a lot of depth - up to 30 ft in this location. This driveway to the shopping center uses brick much as the intersection does - to alert cars to the pedestrian zone and to get them to slow down. 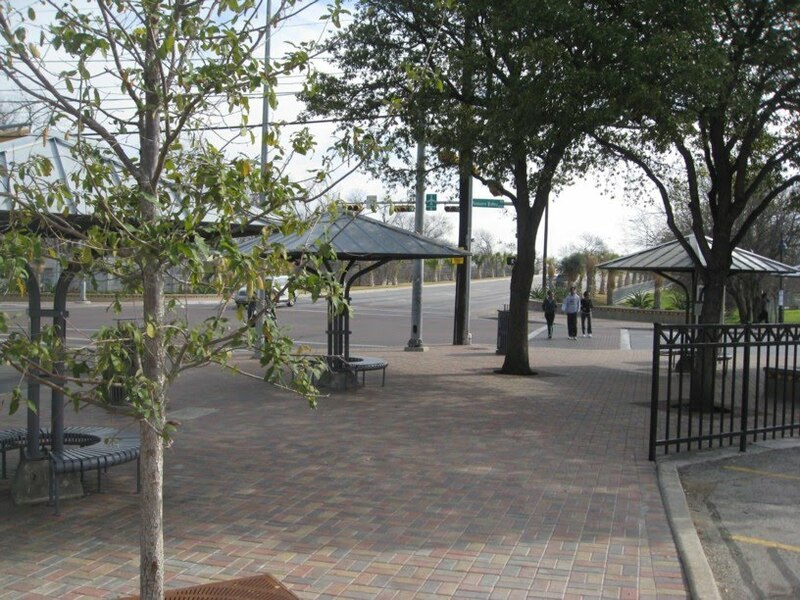 In some places that already had front-side parking, the parking lot has been replaced with a pedestrian-oriented companion street. 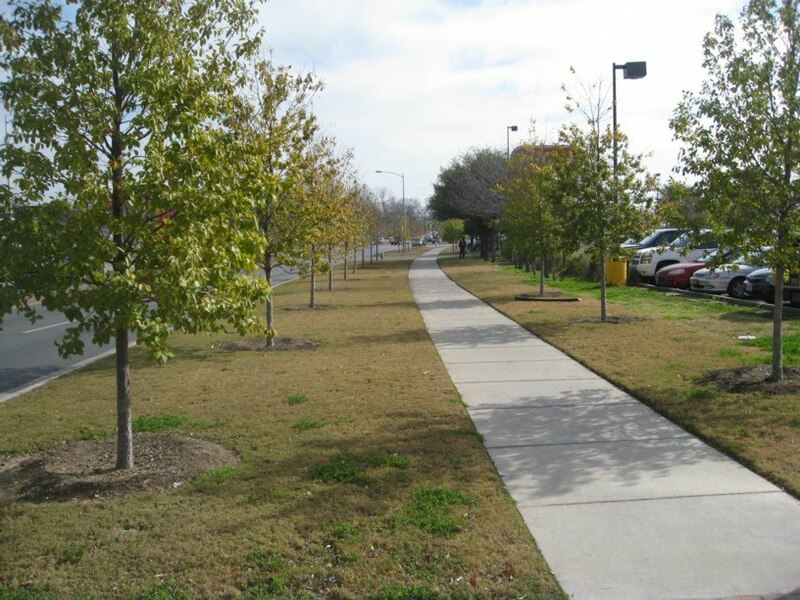 There's not enough space for trees here, but the effect is still more pleasant than a traditional parking lot. 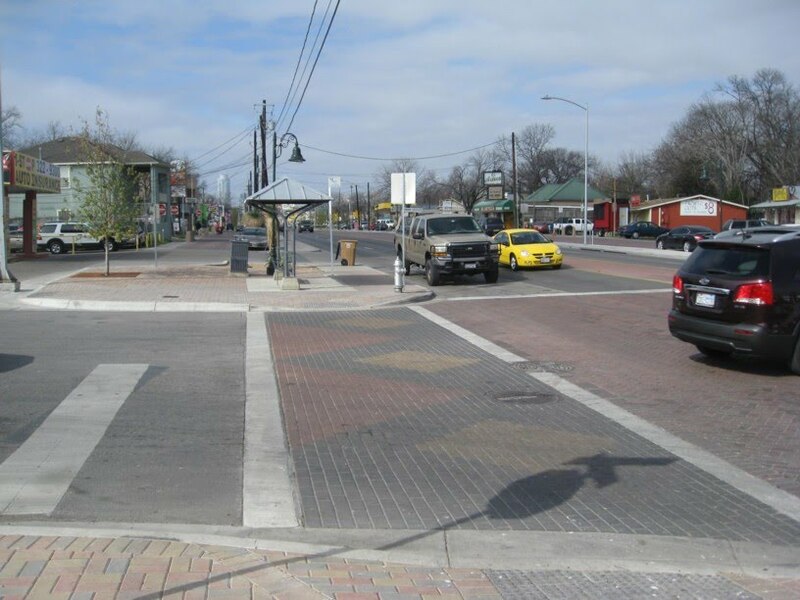 The brick patterns at crosswalks use colors inspired by the local culture, which in this area is Hispanic. 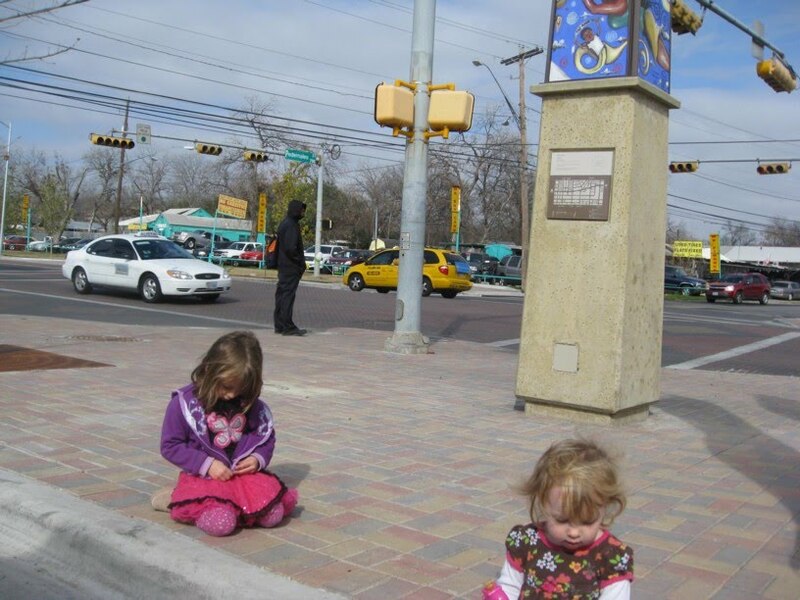 This is the same pedestrian crossing before paving stones were applied. Before scene of 7th and Prospect. After scene of 7th and Prospect.